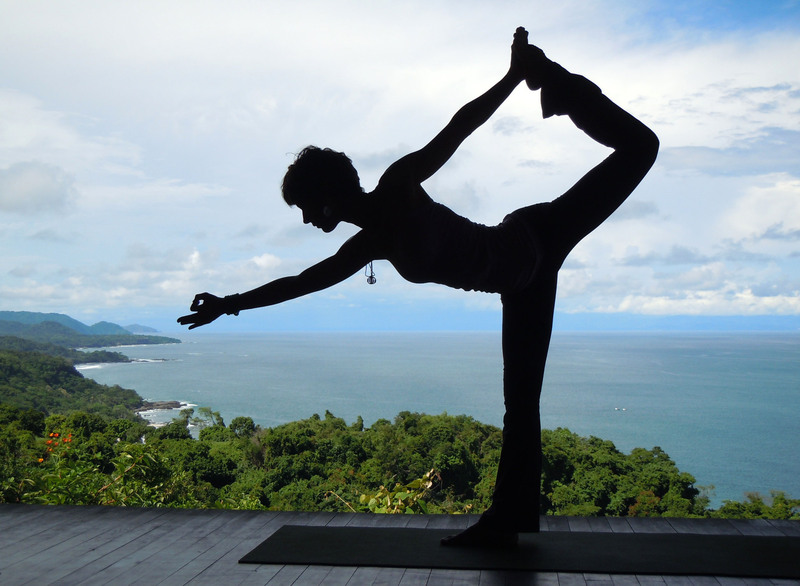 Life doesn’t get much better than escaping on a yoga retreat in Costa Rica. The yoga deck at Anamaya Resort. I realize it’s been awhile since I’ve posted, and I’m chalking my absence up to an overwhelming schedule. In addition to traveling, and my regular day job, I’ve been busy working on my yoga teacher training (which I’ll be finishing later this month!). 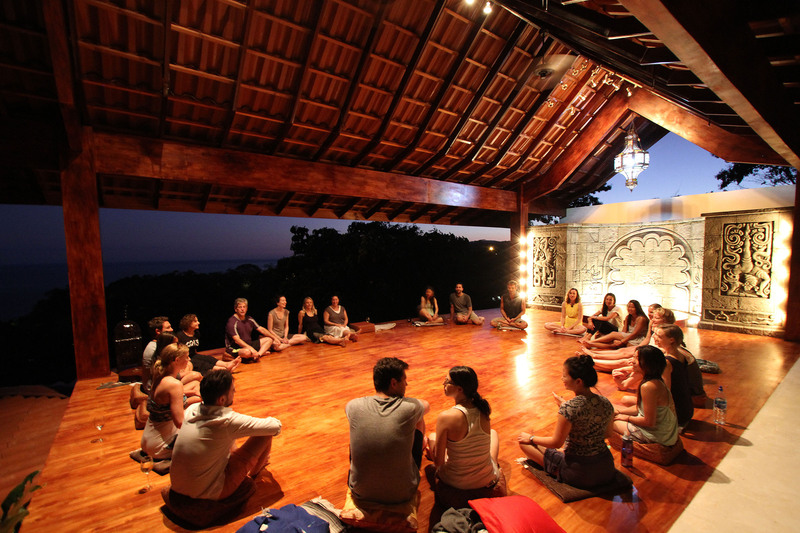 So, I thought what better way to combine my two loves than writing a post on yoga retreats? 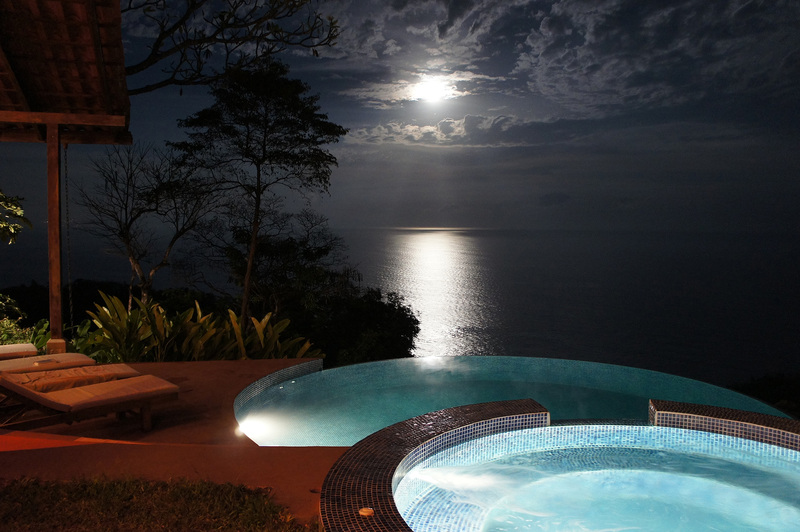 Anamaya Resort, an exotic yoga retreat and eco-lodge located in one of the world’s most tropical beach towns of Montezuma, Costa Rica, is just the place to indulge these passions. 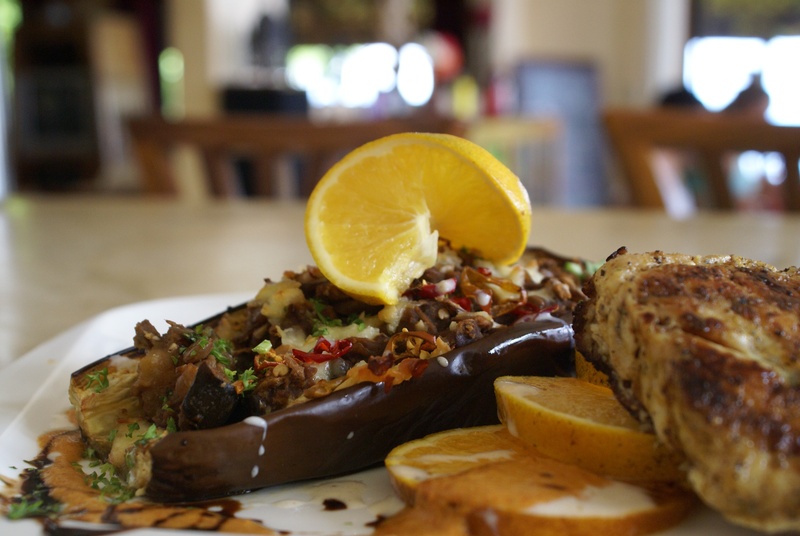 Stuffed eggplant at Anamaya Resort. Located within the lush Costa Rican rainforest with nearby waterfalls, and sited on a cliff edge that overlooks the Pacific Ocean, Anamaya (Sanskrit for good health) offers an array of yoga classes, workshops and teacher trainings; adventure retreats; and spa services (including Thai massage and Reiki treatments). The resort also features an organic farm, with fresh produce picked and prepared daily as part of the gourmet culinary offerings (vegetarian, vegan and gluten-free dishes are available). Of course, you’ll also find local excursions on offer (like horseback riding and canopy tours), plus special performances (such as aerial silk dance, fire dance, musical performances and kirtans and, sometimes, even fire eating). The Bali Cabina is the most popular room accommodation at Anamaya Resort. As for accommodations, Anamaya offers 12 different rooms and cabanas—each featuring non-toxic building materials, organic fabrics and local artwork. 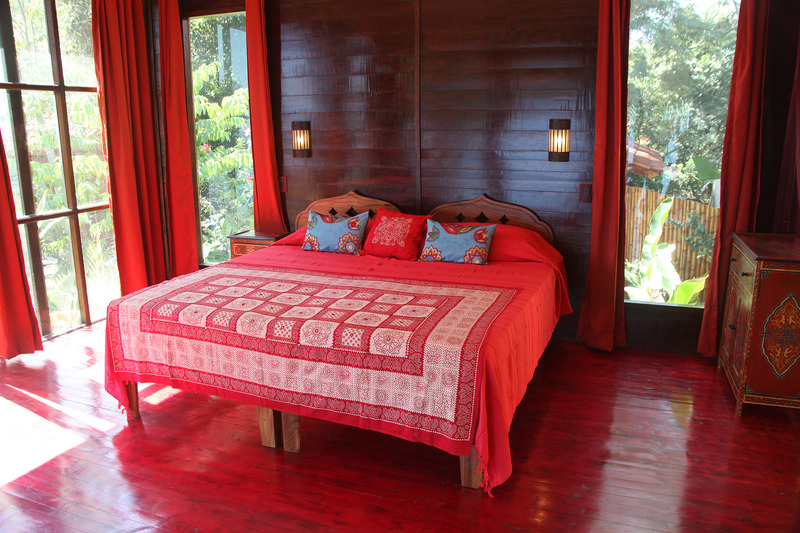 The Casita and the Gaia House both can accommodate up to five guests, while most other offerings accommodate two to three guests. The Bali Cabina—the the most popular room offering at Anamaya—features a king bed or two twin beds, a large outdoor garden bathroom with shower and bathtub, and a deck with hammock. It was actually designed and made in Bali, then disassembled and shipped to Costa Rica (where the bathroom and deck were added). Among the number of yoga retreats offered at Anamaya, the Yoga & Adventure retreat, the Yoga & Rejuvenation retreat and the Pure Yoga Retreat are three that I’m excited to try. Yoga & Adventure (starting at $1,060) includes seven nights accommodations, three organic meals daily, 10 yoga classes (beginner to intermediate), a beach bonfire excursion, unlimited infrared sauna treatments, a waterfall hike, a zipline canopy tour or surf lesson, a circus performance and more. Meanwhile, Yoga & Rejuvenation (starting at $1,160) includes seven nights accommodations, three organic meals per day, up to 10 yoga classes and two 60-minute massage treatments. Pure Yoga (starting at $990) doesn’t include excursions, but it does include seven nights accommodations, three organic meals per day and up to 10 yoga classes. The salt-water Infinity pool at Anamaya Resort. The retreat center also boasts a sunrise yoga shala with ocean views, a salt-water Infinity pool, high-speed Internet and a media room for lectures and classes. Other retreats available at Anamaya include cleansing and detox retreats, meditation retreats, surf camp, aerial yoga retreats, creative arts circus retreats and scuba diving certification. Yoga is front and center at Anamaya Resort. MJ Shaw, yoga expert and teacher at Anamaya Resort, suggests a number of yoga poses for weight loss—the perfect recipe for sticking with your New Year’s resolutions! Sun Salutations – This is a popular opening sequence for warming up. It uses all of the major muscles in your body and can kick-start your heart rate to reach its target zone! Warrior 3 Squats – It’s your regular Virabhadrasana III, but, this time, you’re going to bend and straighten your supporting leg. Do this 10-plus times on each side, and you’ll rock those quads, hammies and glutes—and get your cardiovascular system rolling! Plank Pose Sequence – This is amazing for your abs, and it works wonders on your internal and external obliques! The sequence is: center plank, then to one side, back to center, to the other side and finally back to center. Make sure to hold each for three to five breath sequences, and you’ll really work your core! Handstand Push-Ups – Whether up against the wall (or if you’re daring enough to try it freestyle! ), this position—called Adho Mukha Vrksasana—conditions your arms, abs and chest. Challenge Pose: Scale Pose – This is one of the more advanced poses, but it provides awesome conditioning for the arms and abdominals! Yoga by the Infinity pool at Anamaya Resort. Another great tip to start off your day is by incorporating a healthy green drink that’s chock full of anti-oxidants and vitamins. Geoff McCabe, CEO of Anamaya Resort, recommends using dark greens (such as kale, broccoli, chard and spinach) with delicious fruits to sweeten things up (such as green apple, orange or banana). The most important ingredient is lemon, which helps your body to absorb the nutrition in greens! Thank you very much for the news, it’s very an attractive offer!